Humanity has colonized on a tidally locked planet known asPendomus, a planet of extremes. Half eternal scorching desert and half perpetual arctic night. Surviving along the temperate band between the two, we've set up home in a complex known as the Helix. Within the Helix lies a highly sophisticated, highly technological society that seems to function solely on humans fulfilling their life's purpose. That purpose is determined and nurtured through a person's natural aptitudes, as read by their daily brain scans. Eating, sleeping, even procreation is handled by professionals. These basic concepts, no longer a part of society's every day norm. Born and raised in central MN, Carissa Andrews has always loved books. She started her career at 15 in a bookstore, just to be able to afford her book fetish. By 19, she worked for a magazine publisher. At 22, she was working for printers to learn their trade. At 27, she went back to school for graphic design, and became an award winning designer. Little did she know all of her experiences would lead her to becoming a self-publishing power house. At 31, a magical world on a planet far away, invaded her mind. At 34, she's learned what she needs to make her work successful. 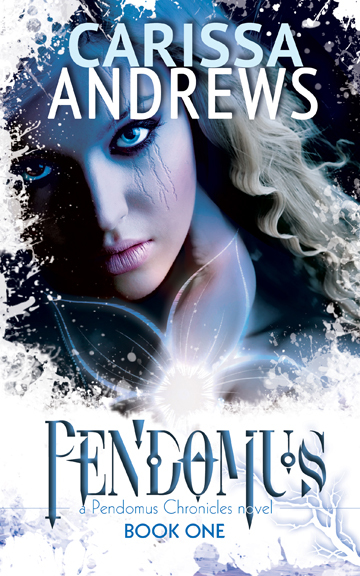 Pendomus (Book 1 of the Pendomus Chronicles) will be released OCTOBER 10, 2013.